Well blow me down with a feather, I was so adamant that the shift dress was not for me. That it would be unflattering, shapeless, I won’t go on. But with some forceful encouragement from Marjorie, I decided to make the Inari Dress. Lo and behold, I love it! (I have since made two more, but I will share them at a later stage). I made this using a shibori linen from Spotlight. It is buttery soft and oh so cool to wear – a summer must! The fabric was ridiculously marked down to about $10 total for the dress – who doesn’t love a bargain?!! This is a super quick make, there are really only four seams, sleeves to set in, finish the hem, neck and sleeves and you’re done! Fit wise, I used the 42 for the shoulders and graded out to a 46 for the hips and I am very happy with the fit, I didn’t even do an FBA, yep super lazy I know I probably should but it seemed to work (and really, cutting smaller shoulder has a very similar result). I love the high-low hem, like a mullet without being one. I am also loving how the side seams wrap to the front. Somehow, it does something clever to the way it hangs and makes it less sack-like. Can you tell I am an instant fan? I really did think this was another one of those blog fads that would wear off, but I can now see why this dress is so popular. Dammit, I hate being wrong!! Yay for the freedom of sewing though and being able to try new things. Oooh you are right, this is super flattering and the fabric is gorgeous too. The way this dress hangs is just beautiful. Thank you, I love wearing this! I agree. I couldn’t see the appeal of the Inari at first – then curiosity fit HR better of me. One of my favorite dresses… I actually am delighted to have been wrong! 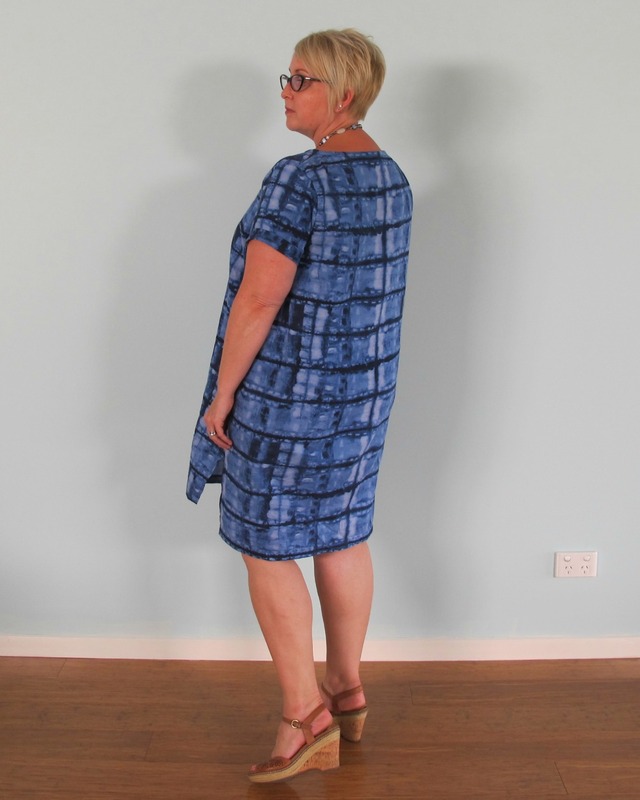 It’s amazing in a nice soft ponte – my Inari has become the dress my daughters always pull out of the wardrobe when I don’t know what to wear! Love love love this print & colour on you. I so wished I’d given into the urge to buy it! In this regard, you are much, much smarter than me! Oh, this is just beautiful on you! The silhouette is both chic and breezy at the same time, especially in that gorgeous linen. Lovely work, Liz! I was also skeptical of how this would look on me, but now I may have to try it… Thanks for the inspiration! Looks fabulous! I just tried this dress for the first time myself, and other than it riding up when I lift my arms, it was a success! It does like to ride up when you lift your arms!! So cute! I hear ya… didn’t get the appeal at first, but now I’m dying to make one as soon as spring rolls around! I am tempted by this pattern but then ask myself do I need another shift dress pattern. You are not making my decision easy. Your dress is lovely and you look fabulous in it! I’ve been sceptical about this pattern too, having a curve or two, but you look terrific in this dress, I might have to change my mind too. What a bargain with the fabric. Like so many, i’ve been resisting this dress for a while… but man, you make it look good! Are you going to play with the armscye and make more? You’re right, you were wrong – this dress shape trally suits you! It looks very elegant, and the colours are also great on you. You’re making me think I should revisit this pattern…. Do it!! It’s a winner!! Well good on Marjorie ;o) I never saw this linen at spotty, very nice. The hemline reminds me of the stylearc elsie top that I quite like, might get that when it turns into sleeve weather. She is worth listening to 😉. I want to make this as a top too, although may combine with the scout so I can raise my arms! Hehe, I think it was me who was right. I knew this pattern was made for you!!!! And I love this particular Inari on you, as blue is your colour. Fab dress. I have this in my sewing queue. Thanks for the tip about it coming up short. Will bear this in mind when I make mine. It is super short, even for my 158cm!! It really looks good! I totally love the fabric. Oh you are killing me. I have resisted thus far…..
Mwah haha!! Of course there are other shift dresses, I just didn’t have any, totally new shape for me. I absolutely adore this on you! It’s such a different shape on you and you’re killin’ it! I’m so anxious to make one of these… just waiting for the weather to get warm enough for bare legs! Do it with funky tights!! I love this on you! Marjorie actually told me the exact same thing when I objected to the inari pattern at the last spoolettes sewcial I went to. After seeing your success I think I will definitely give it a go. Thanks for the heads up on the length. How tall are you? I am 171cm so might need to lengthen a bit.